Whispers in the Loggia: "He's Our Guy"
But Ricken also is looking forward, preparing to learn more about a diocese seven times larger than the one he’s leaving. The Cheyenne diocese – which encompasses the entire state of Wyoming -- has about 50,000 Catholics, whereas its Green Bay counterpart is almost 350,000 strong. Catholic day school education likely will be among Ricken’s chief challenges as Green Bay’s bishop. The diocese is moving forward with its Faith Alive plan, a big component of which is Catholic school education, but major components of that plan have yet to be worked out. At the end of June, diocesan officials announced the closure of Holy Apostles School on Green Bay’s west side. Two years ago, St. Philip the Apostle School closed its doors and Trinity and St. Joseph schools – which later became Holy Apostles – consolidated. The Cheyenne diocese has had success with Catholic education in recent years, Ricken said, building new schools and working to help found Wyoming Catholic College. The Green Bay diocese has been without a bishop since Sept. 28, when former bishop David Zubik was installed as the head of the Diocese of Pittsburgh. 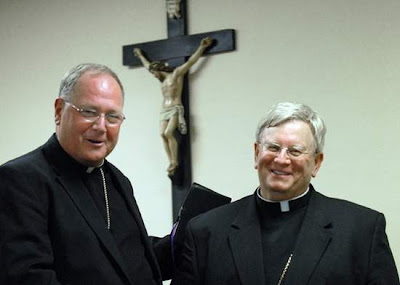 Milwaukee Archbishop Timothy Dolan has been serving as apostolic administrator in the absence of an appointed bishop. Dolan today expressed utmost confidence in Ricken. Diocesan officials did not know early this afternoon whether Ricken plans to visit Wisconsin to attend the Green Bay Packers' first pre-season game on Aug. 11, against the Cincinnati Bengals. Known as the annual Bishop's Charities Game, it raises money for charities of the Green Bay Diocese and is traditionally attended by the bishop.